Micro Crush, Portable Guitar Amp from Orange in the Crush PiX series. If you are bored at work and need to get some cooling down time with a guitar and amp in hand but limited in space and noise, then this is a nice amp for you. This is a great little practice pocket amp for those who are in need of some jam time and need to be quiet or on a tight budget. The tone from something this small is quite amazing! 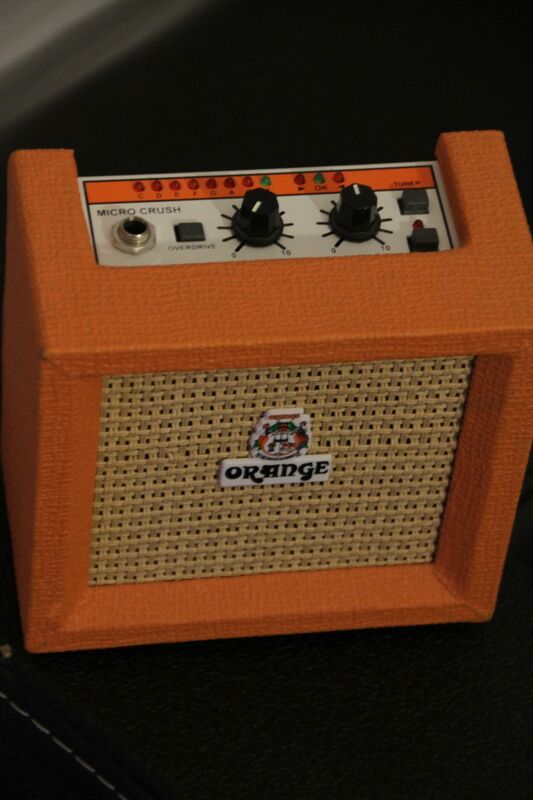 It actually replicates a very close tone to a real tube Orange amp. It is obvious that the tone will be different but the character of that famous orange British tone is all there in a small package. It doesn't matter what guitar you are playing with this amp. You are intending to quietly jam away in piece. So grab what ever guitar is your favorite and jam along with a pair of headphones. The amp will not take away from your guitar's natural tone. Another great feature I love about this amp is that it has a tuner built right in. So all you really need to carry with you is your guitar and or headphones and a cable. This makes jamming in your home or office a lot more convenient. At new these amps come in at around $60, which is a fantastic price for something this basic and portable. It carries a strong tone for those worried about how good it can sound. I highly recommend this amp for the silent player at home or office. This is the type of amp that you hang on your bet buckle and walk around the room jamming. This is about the size of a cell phone and has mini speaker in it with surprisingly two channels. The is for the person who wants to hide from his boss in his office and still be able to practice away without being disturbed. The sound in this pocket amp isn't great but that really is only secondary to the purpose of it. There is a huge market for these little pocket amp for people to use sitting back in their chair chilling out playing. Marshall, Vox, and Fender have all contributed to the trend of pocket amps for practicing. There is only two knobs that control the sound of the amp. It has a volume and tone a channel select and a head phone out for silent usage. It even has a built in tuner for tuning on the go. The sound is cool since it has two channels of clean and gain. 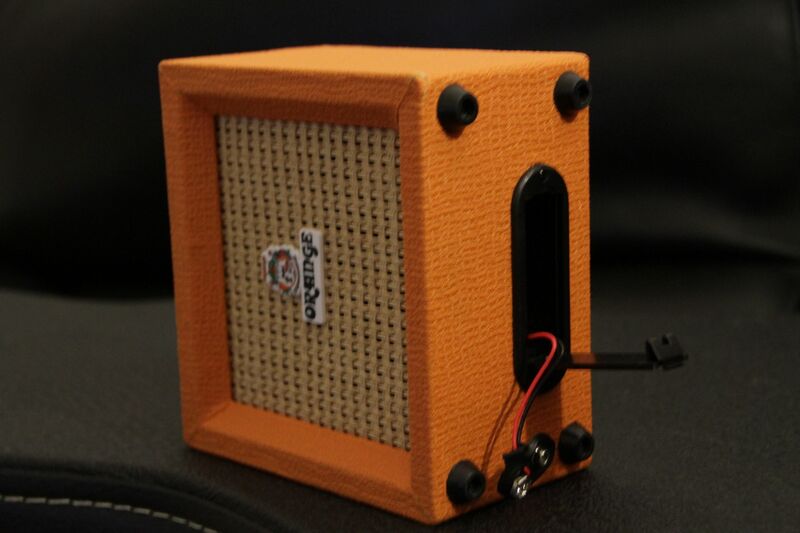 It isn't going to sound like your Orange AD30 or anything but it looks like an Orange amp and it hangs on your belt nicely. With only two knobs just turn the gain all the way up and the volume as desired. That is pretty basic as it gets. Try it with any guitar that you have. There really is no right or wrong or better sounding options here. They are all going to sound pretty much the same. Again this is not quality tone we are talking about....we are talking about practicing with a pocket amp. You probably won't hate this thing if you just going for the easy of lounge jamming. This thing is fun and that is really all there is to say about it. Not going to be a main amp for gigs or anything like that. Just sitting at home or at the office plucking away from boredom. I would recommend this to anyone bored at work and has their own office. It does have a headphone jack so it can be silent. Just close the door grab your guitar and headphones and kill some time. Don't take it too seriously. They are priced at $60 and that is pretty fair for what it is going to go you. 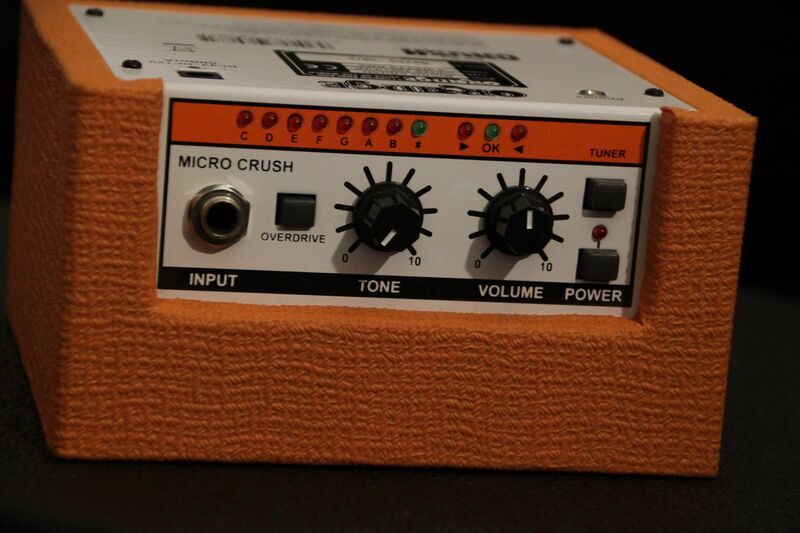 Even if the Orange Amps Micro Crush is your first amp, everything on here is super easy to use. It's got knobs for volume and tone, as well as a button for built in overdrive. It also has a built in tuner with LED lights that show you the note you're tuning to and how far off you are. The amp is definitely easy enough to use where a manual isn't needed. To date I've only used the Orange Amps Micro Crush for messing around and practicing, but would definitely like to try it for recording in the future. Little amps like this can sometimes give a big kick in terms of sound in the studio when mic'd close up. The overdrive isn't as biting and full as that you'll find on larger Orange amps, but were you really expecting it to be anyway? It's awesome that it has some drive in here at all, and it actually doesn't sound bad at all. I used mostly the clean sound on here when I've used it however, which comes in nice and crisp. If you're running it with a nine volt battery, be aware that as the battery drains your tone will change a bit as well. 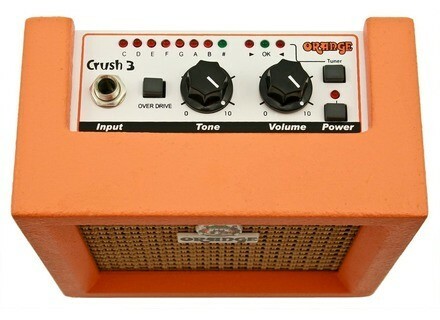 Those in the market for a mini portable guitar amplifier should absolutely be aware of the Orange Amps Micro Crush as it's probably the best mini amp out there. It's about the same price as similar amps made by Marshall and Fender, but in my opinion has the most realistic sound and most options. The tuner is a huge plus as you can spend this amount of money on a tuner alone if you wanted to! This amp is great for beginners looking to get a small practice amp, but also works great for players on all levels just looking for something portable. 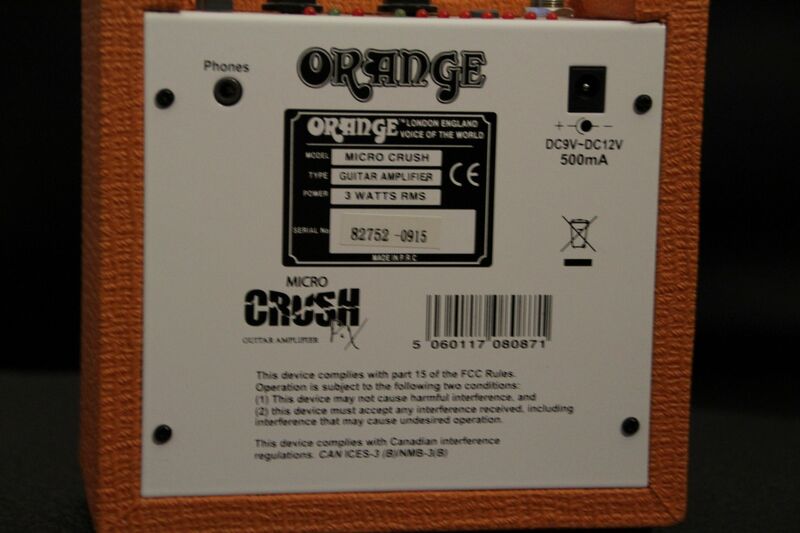 The Orange Amps Micro Crush is up there with the best of it's kind! -KNF-'s review (This content has been automatically translated from French)" A great surprise"
Everything is discovered alone with this amp. You get a clean sound but will quickly tend to cruncher (3Watts require). And it was also an overdrive. Playing between Tone and Volume, it is easy to have good sound. So, first of all, this is not the kind of amp is used to do the Stade de France, to repeat in a group or to sign his unique sound, it's still the gadget. Finally yes and no! Yields very pleasant sounds, from clean to crunch a background, we can increase by increasing the volume of the box. If AC is not enough, then engage the overdrive button and there you go. The amp delivers an overdrive / crunch that has character and a grain! We can play good dirty blues, and go up sounds kind ZZ TOP. Really it's the taff. I repeat this is not an amp for THE sound. But to play on the couch or something or it's really fun and very correct! The amp has a tuner integrated LED easy to use and very fair! What more. I used other for almost a year, and it goes well in addition to my other amps. I will never resell! Its look is fabulous, and the sound too. I tried the Marshall MS-2 as well. It is plastic ... Hollow and more. While the Orange MICRO CRUSH is wood! With Alu panel beautifully. Truly the best portable amp I've tried!